Have you always dreamed of a day when you could sweep the house with little to no effort at all? Well that day has arrived, and arrived in an affordable way with the Deenkee Robot Vacuum Cleaner. 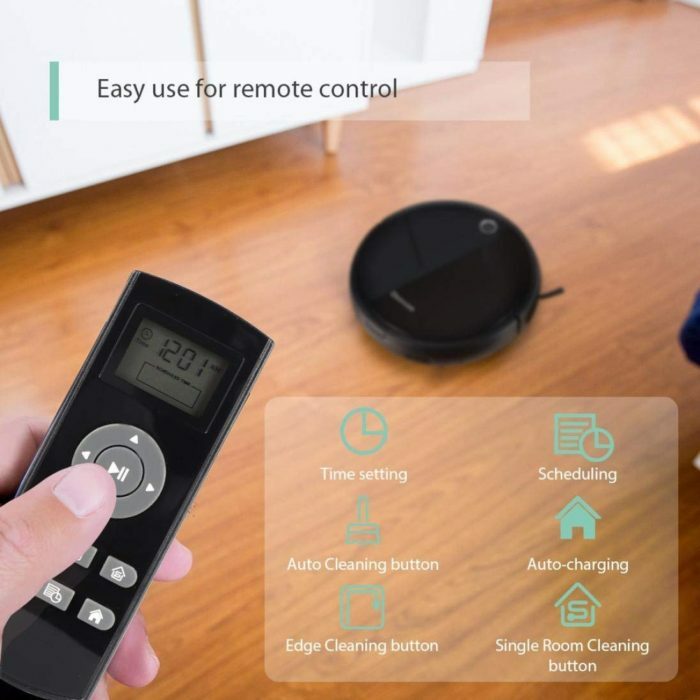 Increasing your time and cleaning power with the Deenkee remote controlled vacuum cleaner. It is as simple as this – purchase the vacuum, open it up upon arrival, plug it in and let it charge and then relax and watch as Deenkee sweeps the floors at the touch of a button. This robotic vacuum has a 3.15-inch slim shape that enables it to clean under furniture, tables and more. Even under the bed if the kids can keep it clean under there! 11 sets of obstacle sensors make sure the robotic vacuum cleaner cleans thoroughly. Its anti-collision and drop-sensing tech enables the cleaning to go smoothly. Also, the amazing climbing ability allows it to get across 15mm height places to clean more areas. Accessories include the charging base, remote control, brushes and fantastic customer support to troubleshoot any problems. Technology at its finest! The timing, scheduling, auto cleaning, edge cleaning and Zig-zag cleaning is designed to meet a different need. Max 100 Minutes Battery working time supports quiet, consistent cleaning. And the auto charging function makes sure the robot vacuum will go back to charge itself as the battery runs low. You also get a 1 year warranty with your purchase. The vacuum also has an amazing optional wet/dry mop for deeper cleaning on vinyl or hardwood flooring. This is perfect for my kitchen and dining area! Don’t let the holiday hustle stop you from doing all you want. 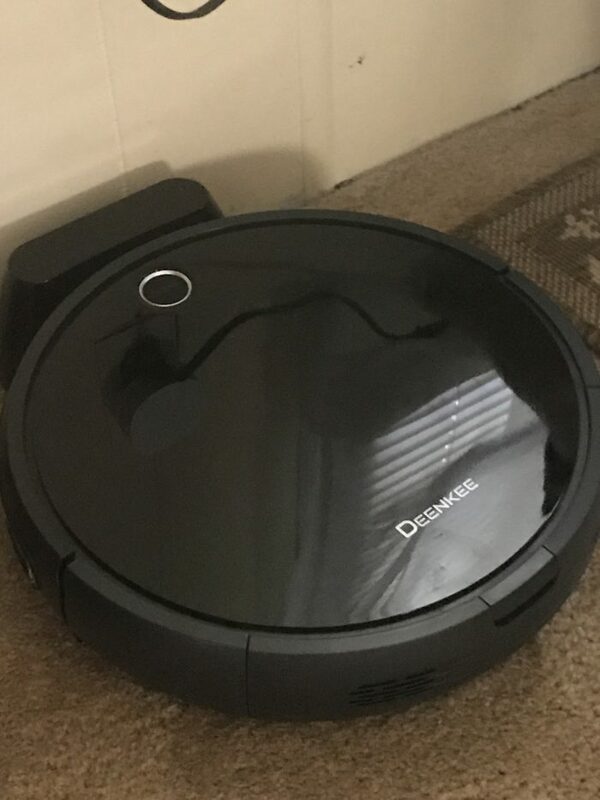 Get the Deenkee Robot Vacuum today for your household cleaning needs and save that sweeping time for other things like shopping, baking, more time with the family and much much more. Right now you can get this robot vacuum at a SPECIAL PRICE – checkout on Amazon and use code HRJD3G3F to save $70 off the regular purchase price. That is HUGE SAVINGS just in time for Christmas. Hurry and get this deal, as the code expires on 10/30/18. I would love to have this!! Convenience is Key! I love the features this has. Would be really handy to have during holiday entertaining! This is the best robotic vacuum I’ve seen. I love that it has up to 100 minutes of battery life, and is self-recharging I love how I can control it through my phone. Most of all, I love that it can get under furniture. I have a hard time vacuuming, because it gives me lower back pain. I love that this vacuum with do it for me. I could really use this since I live on a farm. I could really use this vacuum. I live on a farm and have a granddaughter that is learning to crawl so I am always vacuuming. I like how slim that it is! I vacuum several times a week, this would be amazing! I love that there is no assembly. It is so nuice for something to arrive needing only to be charged before using it. My children would all be mesmerized if we had one of these! I would be thrilled to have a convenient and easy to use vacuum like this. So modern also. I love the accessories and especially the remote control to this. Having one of these would definitely make holiday cleaning easier! Another great feature is that the vacuum also has an amazing optional wet/dry mop for deeper cleaning on vinyl or hardwood flooring. I am just thinking of all I can do with the time I would normally spend vacuuming….. This would save me a lot of time on cleaning! I always host the holidays. With all the kids and all, this would be so fabulous for helping keep the crumbs up so my dog does not eat them and get sick. I would love to get one of these for Christmas! I like that this vacuum is so slim that it can even fit and clean under a bed! I really like all the features this has! We have three dogs and two cats, so you can imagine I’m constantly having to clean up pet fur, dog food crumbs, cat litter, etc. I would absolutely LOVE one of these to help me keep up with the minute-to-minute cleaning. I’d love to see my furbabies’ reaction to this, too! I vacuum every day, so it would be so nice to have one of these to do it for me! That wet/dry mop is the crowning touch for me. I like that it will remember to charge itself. As a senior this would really make my life so much easier. This would be such a fun vacuum to have around the house! I like that it has strong suction power! I could really use one of these! I love that it has a remote control. I love that this vacuum has a 3.15-inch slim shape that enables it to clean under furniture and tables! I love the idea of having underneath my bed cleaned! That never gets cleaned! I’ve always wanted one of these! I have to vacuum all the time because I am allergic to pet dander. There’s no way I’m getting rid of my for baby Mia! Crossing my fingers I win! I didn’t know it had wet dry! This would be great with two labs, a toddler and baby 2 coming any week. I like that this vacuum has an easy to use remote control. That is a super bonus. I have a bad back and can’t vacuum and getting my hubby to vacuum is a challenge. A robotic vacuum cleaner would be a great for us! This is the best Christmas present that just keeps on giving! I have been wanting one of these for awhile as I sm sure everybody else on here does too! I feel like it is so hard to keep up vacuuming with 3 kids and a dog. My middle child especially always has crumbs and food near him, on him and leaves a trail and our dog never even tries to clean it up surprisingly. I like the remote control feature and i woild definitely keep this for myself. 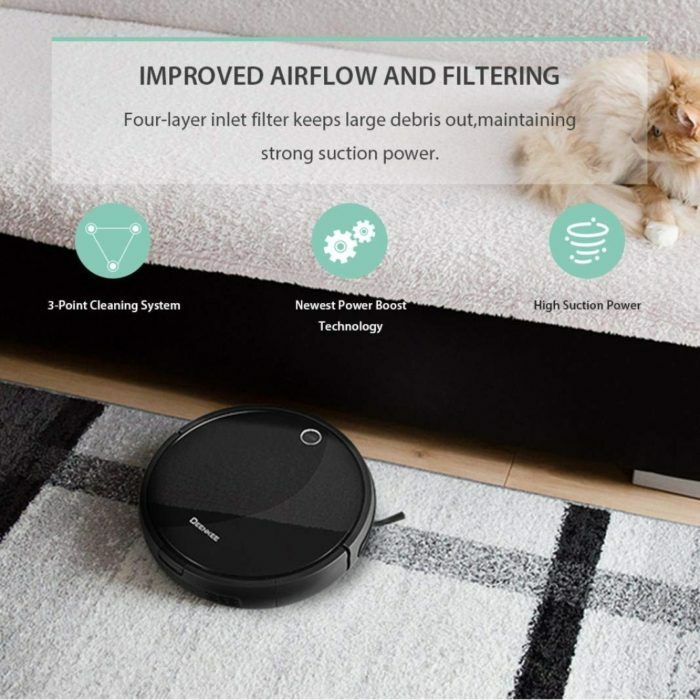 I do like that Deenkee Robotic Vacuum Cleaner does come with 2 HEPA Filters, that is terrific. I need a robot vacuum. I could use one of these since we have 4 indoor pets! We are putting in vinyl planks in 95% of our home by Christmas. We are used to carpet so it will be a change. I can’t imagine sweeping all the time so a Deenkee robotic vacuum would be perfect! Anyone would be happy to have a convenient vacuum like this one. I would love to get one. So cool! Nice review. I had one many years ago…when they first came out. Loved it, but sadly it died …from overuse. Was a solid performer. I really need a new vacuum and this one looks great! This would be amazing with having a dog that sheds a lot and kids who drop food crumbs! I’m all for making the holidays easier. Having a robotic vacuum would make cleaning my condo a whole heck of a lot easier! I love this vacuum. It looks so easy to set up and use. Thanks for sharing this information. This would be a great gift to find under the tree this year! I’d love this as a gift for myself ! Love that you can control it with a remote control! SOLD! Most definitely on my list of things that I need 🙂 I would love to have this especially seeing that are our house treks in a lot of dirt with 4 kids and a dog! My children would love it if we got a vacuum like this! This seems like a wonderful and modern vacuum to purchase. 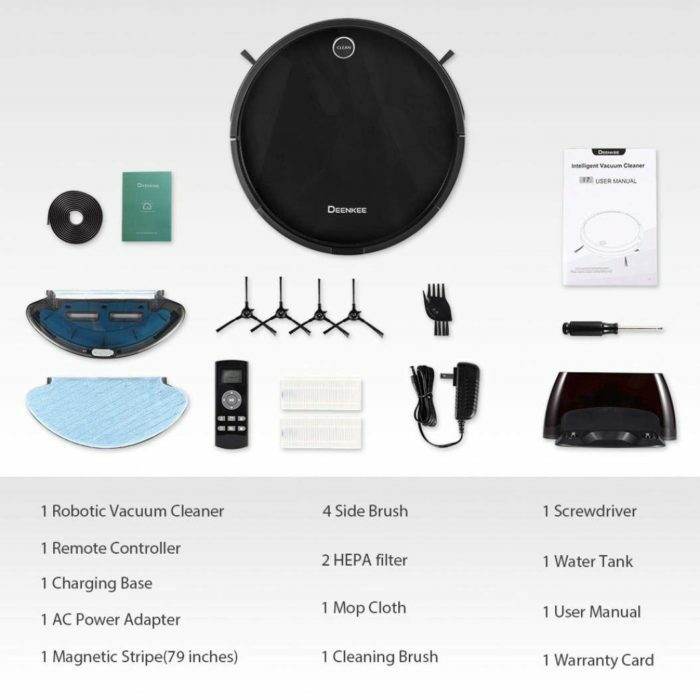 The Deenkee Robotic Vacuum Cleaner would be a perfect Christmas Gift for me. That will be on my list. I’ve always been pretty skeptical of these robot vacuums. I’ve never seen one work. But I’d sure as heck give one a try! Any less work for me I’ll take! I can’t believe how much they have improved these vacuum cleaners since they first came out. I have always wanted one…so I’m crossing my fingers and my toes! haha. Happy Early Halloween everyone! Having a Deenkee would sure save me lots of time and would be able to get into spaces that my regular vacuum cannot. I love that it has a wet/dry mop for deeper cleaning on vinyl or hardwood flooring. What a bonus! I just love the Deenkee Robotic Vacuum Cleaner, I bet it will work great in a finished basement. Just like mine. I have two dogs, one cat, and wood floors……would LOVE to win this giveaway and give my broom, Swiffer, and vacuum, and the person (myself) that has to use them DAILY or I’d be lost in a hairball, a much-needed break!! This vacuum would help me so much! I have 2 young children, which means a lot of crumbs on the floor. I feel like I spend too much time vacuuming. This would really save time, energy and stress. I love that it runs on remote control. This is a must-have in my home. We have 3 dogs and 2 cats and its always a constant battle keep all the fur in check. This would be a much-needed addition to our cleaning tools. I could really use a new vacuum and this one looks amazing! I love all of the different features this has. Scheduling a clean time would be great! This vacuum looks like an ideal vacuum for anyone! I love that it can be scheduled and go from hard wood floor to carpet! I love that it’s affordable and has the option of wet/dry mop for deeper cleaning. It sounds like a great little vacuum. I have been wanting a robotic vacuum. It would make a world of difference in how clean we could keep our house. This would help me out considering I’m in a wheelchair and find pushing a vacuum a little difficult and sweeping is not so easy either.